The GL3224E is an USB 3.1 Gen 1 eMMC reader controller, it provides single LUN (Logic Unit Number) which can support e•MMC v4.5, 1/4/8bit data bus, High Speed SDR/ High Speed DDR/ HS200 mode, and it is compatible with e•MMC v5.0. The GL3224E integrates a high speed 8051 microprocessor and a high efficiency hardware engine for the best data transfer performance between USB and various memory card interfaces. 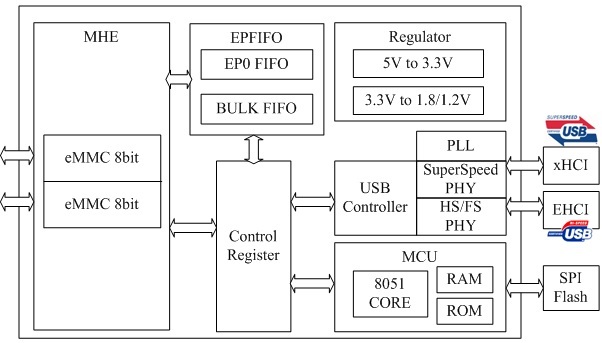 It supports Serial Peripheral Interface (SPI) for firmware upgrade to SPI Flash Memory via USB port. It also integrates 5V to 3.3V and 3.3V to 1.8V/1.2V regulators and power MOSFETs which can reduce system BOM cost.